[T]he things you have heard me say in the presence of many witnesses entrust to reliable people who will also be qualified to teach others. Every father hopes for something to share with his children: some experience, some common interest, some hobby. You want something that you can talk to your kids about, something that you enjoy doing together. I think from both the dad and kid side of the equation, you want to know that your relationship doesn’t always have to be parent-child. You want the chance, especially as kids grow into teenagers and adults, to have a friendship as well. For Josh and me, one of the places where our relationship turns into friendship is music. Specifically, Bruce Springsteen’s music. I’ve been a fan for a lot of years, and Josh became a fan after I shared it with him. So imagine our excitement - mine, especially - when we heard the announcement this week that he’s coming to play at Wrigley Field in September. 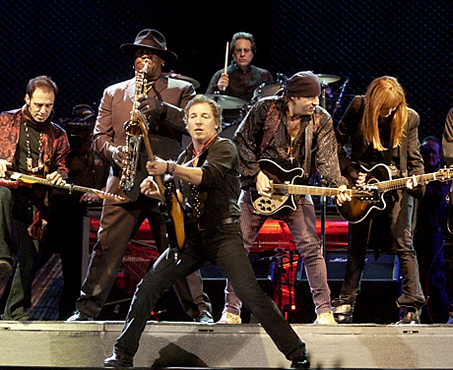 Springsteen’s legendary live shows are a big reason that I became a fan. (I saw him play for three and half hours once.) I don’t necessarily expect that this show will be a marathon - the guy has his AARP card now, after all - but I’m looking forward to sharing with my son what is, in this era of Auto-Tuned and lip-synced “live” shows, for my money one of the best live music experiences out there. I would enjoy seeing Springsteen with my wife (though she hasn’t quite developed an appreciation for The Boss). I’d enjoy seeing him with friends, or even alone. But it means more somehow, that I’m going to see him with a young man who’s seeing him live for the first time, and that I can share that with him. I hope, though, that music isn’t the only thing we’ve shared. None of us would argue, probably, that Christianity isn’t intended to be shared. In fact, the “good news” at the heart of our faith is passed down from one person to another, one generation to the next. That’s how it continues to speak to us, continues to have relevance in a changing world, continues to breathe hope onto the dying embers of human hearts. The faith exists because it’s been passed down. The “pattern of healthy teaching,” as Paul puts it, is what we’ve heard. It’s nothing we create, or make up, or develop through focus groups and measuring trends. It’s what we’ve heard, which means that it comes from outside of us. It is to be heard, and guarded, and then passed on. Jesus wrote nothing, isn’t that interesting? Nothing that’s lasted, anyway. But others were there, and they listened and they saw, and eventually they got around to telling what they heard and saw and reflecting on what it meant. And eventually those recollections got written down, and then copied, and copied some more, and shared in the church. And still, today, people all over the world reflect on what they’ve received, and hear it read, and then go try to live it. And share it again. Sometimes, though, we get mixed up. Sometimes we get confused as to what it is that we’re supposed to be sharing. What if I had tried to pass along to Josh my interpretation of Springsteen’s music, without letting him hear much of the actual music? What if, instead of listening to him while we drove, I spent the time telling him why Darkness on the Edge of Town was superior to Wrecking Ball? What if I had spent the time lecturing about why vinyl is superior to digital downloads? Oh, he might conceivably kind of enjoy my interpretation. Maybe, if I was compelling enough, it might even move him like Springsteen’s music. But it wouldn’t be the same thing. And it would be really, really hard to dance to. Sometimes churches and church leaders, in the name of trying to guard what they’ve received and making sure it gets communicated faithfully and understood properly, have done something much like that to the gospel. We’ve made it hard for people to hear the music over our analysis and interpretation. We’ve forgotten that hearing the gospel is much more akin to listening to a great song played live than attending a lecture about a recording of that song. It’s intended to be heard with the same faculties, I’m convinced, that make it possible for us to enjoy good music. The gospel teaches us, of course, but not only by instructing our minds. (Maybe not even primarily that way.) It teaches us by touching our hearts - reaching down to the core of who we are - and moving us. It moves us to repentance. It moves us to hope. It moves us to action. Maybe people in our world are having trouble hearing the gospel right now because we’ve forgotten that and aren’t communicating what we think we are. They don’t want to hear the analysis. They might not always want to hear the music, either - but the Bible says that’s where the power of God for salvation is. And so that’s what they need to hear. And maybe that’s why we believers don’t seem to be doing much sharing of the gospel these days. Maybe it’s because we know intuitively that something’s off, that what we’re communicating isn’t necessarily the gospel that once turned the world upside down. Maybe the first thing some of us need to do to become more effective, enthusiastic sharers of what we’ve heard is to go back and hear again. But this time, not muffled by some church leader’s understanding of what the music is saying. This time, the music itself - what the apostles heard from Jesus and passed down to us - loud and live, until our ears are ringing and our hearts are pounding and our feet are moving. We won’t mind at all sharing that, I think. In fact, it’ll come as naturally as sharing a favorite song with someone we love. And our world will be able to hear the song of the ages. And some will even dance.